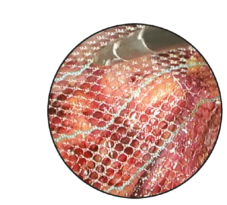 The special textile construction makes it easy to insert the mesh via the trocar and to unfold it intraoperatively. The antislip surface and special selvedges ensure wrinkle-free positioning. The green marker lines perform a dual function. 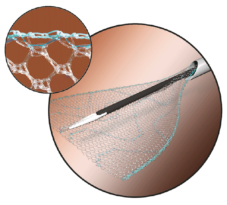 They are used for rapid orientation and visual monitoring of whether the mesh is positioned tension-free. DynaMesh®-ENDOLAP was developed specifically for endoscopic (TEP)1) and laparoscopic (TAPP) techniques. If the surgeon considers fixation of the implant to be necessary, all these methods are available to him/her. 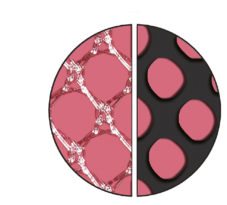 The special warp-knitted structure results in very high textile porosity. It is the basis for very good effective porosity (65%) after the formation of foreign body granuloma, which prevents scar plates while providing high patient comfort.